This article submitted by Aaron Ziemer on 7/14/98. 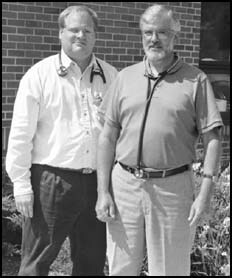 Gene Beavers is a physicians assistant at the Paynesville Area Health Care System. Beavers is enrolled in med school at Augsburg in the Twin Cities. He is in Paynesville as part of his 27-month program and has six weeks remaining. Augsburg has a unique type of program. The first 12 months of the program are all in class, the next 12 months are all in a work environment, in different fields. Then the last three months is a full internship at a hospital. To enter the program the student must have a Bachelors Degree or must have enough of the core credits to qualify for the program. Beavers received his BA in psycology, from Northwestern College in Roseville. He also worked in patient mental health for three years prior to joining the program at Augsburg. He worked in the Twin Cities. Even when he was working in patient mental health, Beavers knew that he wanted to do family practice. Beavers is working on a three month internship in Paynesville. He works in both the clinic and the hospital as well as takes call. He is working with Dr. Solum. Beavers is not yet employed when he is done with his internship, but hopes to be employed in a small town atmosphere and do family practice. He grew up in the town of Pine River almost 30 miles from Brainerd. Beavers is married with a daughter who is five months old.